At CADE Estate, we believe that winemaking should honor the land, both aesthetically and ecologically. Our philosophy of making luxury wine in harmony with the environment begins in the soil of our estate vineyard where we maintain a painstaking program of natural cultivation - a rewarding program that made us the first organically farmed LEED (Leadership in Energy and Environmental Design) Gold Certified estate winery in the Napa Valley. 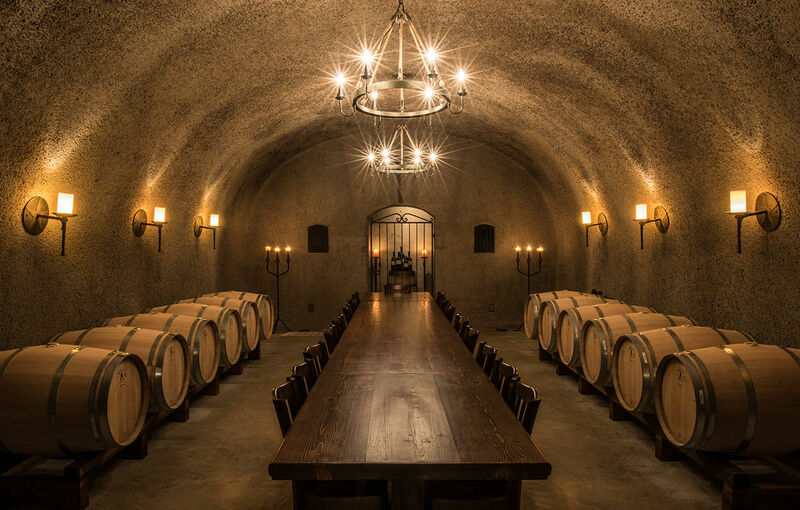 Gavin Newsom, Gordon Getty and John Conover shared a vision to add a complementary estate vineyard to the valley floor terroir of their Oakville estate at PlumpJack Estate Winery. 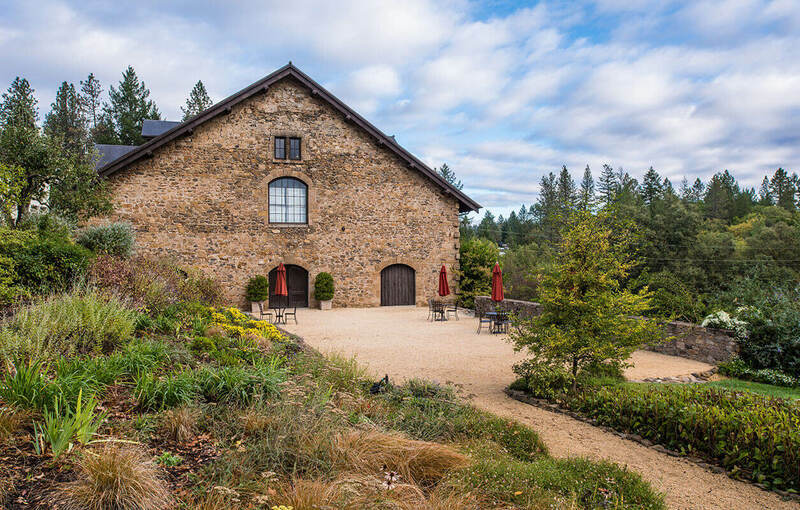 In 2005, that dream came to fruition in the form of a 54-acre estate, elevated high above the fog line, on the dramatic slopes of Howell Mountain – CADE Estate Winery. Similar to PlumpJack, CADE takes its name from Shakespeare, who used the term to describe wine casks, or cades, shipped from Bordeaux to England during Elizabethan times. 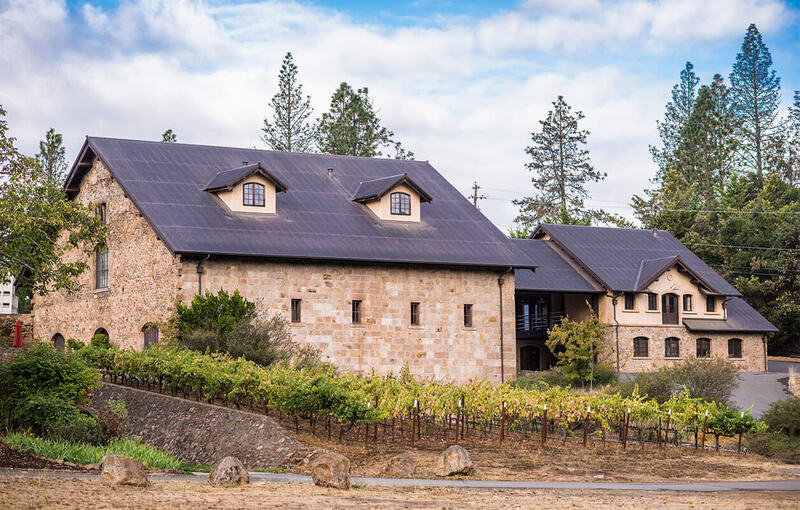 With the opportunity to build the winery from the ground up, Newsom, Getty and Conover were committed to constructing a state-of-the-art winery that pays tribute to the land. The building's striking architecture, a dialogue between gentle contours and strong rectilinear forms, suggests the complexity of our wines– powerful yet nuanced expressions of our mountain terroir. 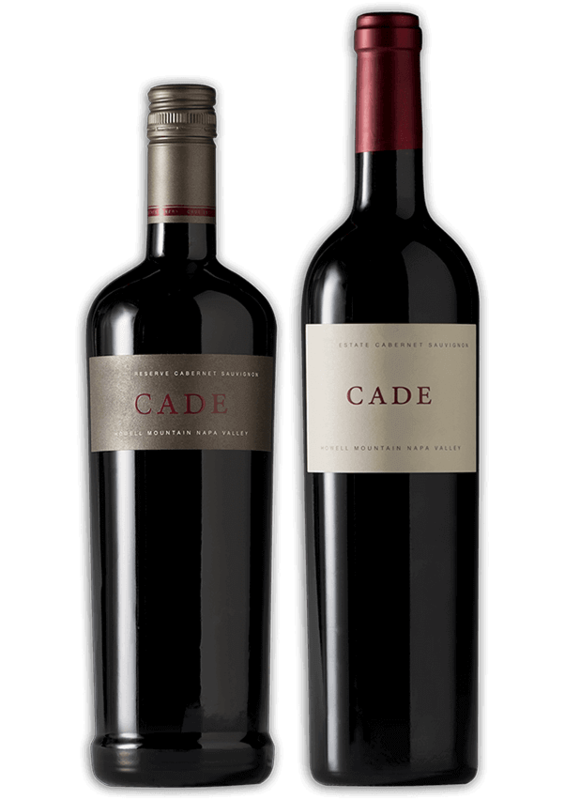 At CADE Estate, we like to call the nuanced, artisanal expression of our wines Modern Howell Mountain – high elevation cabernet sauvignon that articulates the intense, powerful character of our estate while maintaining a balance of mountain fruit, firm acidity and judicious oak for layered, complex wines that reflect approachability and age ability. Elevated above the fog line, with vivid views of the Napa Valley, CADE Estate invites you to unearth the treasured past of Howell Mountain. On the striking slopes and rolling hills within the Vaca Mountain Range, our LEED Gold Certified Estate sits at an elevation of 1,800 feet, blending together organically farmed vineyards, tall evergreens and native Manzanita trees. As an exclusive society member, you’ll experience our modern artisanal winemaking that expresses the unique Howell Mountain terroir, both aesthetically and ecologically. 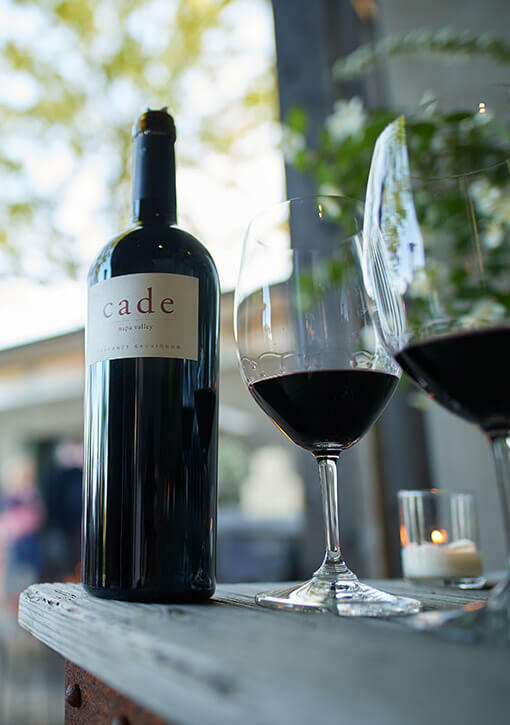 Book Your Experience At CADE Estate, we invite you to discover the ever-changing interplay among natural and architectural spaces, a spot where cultivated vineyard rows meet tall evergreens and native Manzanita trees. 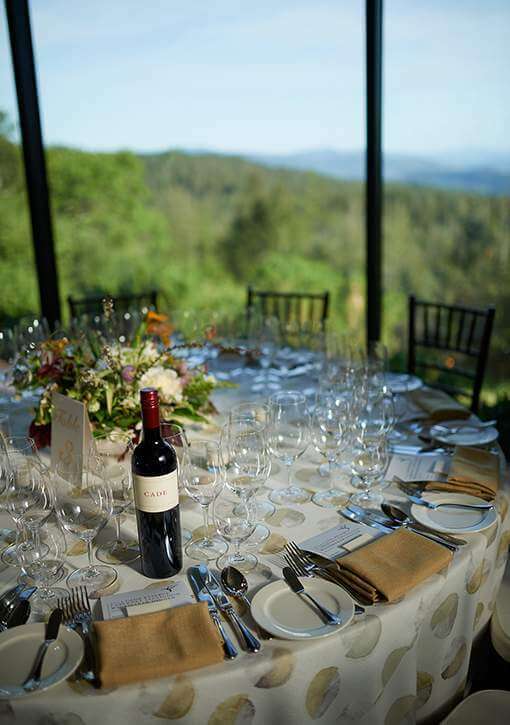 Let our luxury modern Howell Mountain wines satiate your senses, all set against the backdrop of staggering Napa Valley vistas for an experience not soon forgotten. Host Your Event at CADE Estate Let our majestic mountainside estate be your next destination for your memory making experience. 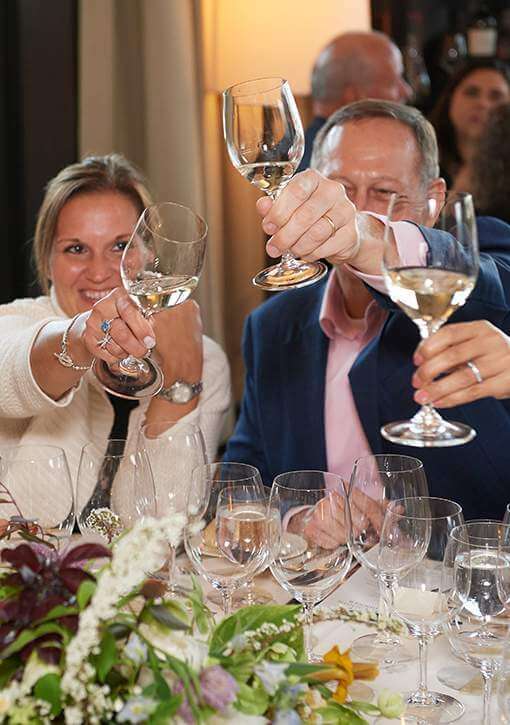 Our dedicated events team partners with the acclaimed Meadowood Estate Events who crafts custom menus from the local season’s bounty to expertly pair with our full portfolio of wines to offer you an unparalleled food and wine adventure.